Dr. Charles Henry Strong: Born 28 February 1828, near Girard, Erie, PA; Died 3 July 1912, Girard, Crawford, KS; Married 30 April 1861 Loami, Sangamon, IL; Frances Fowler: Born 4 December 1836, Sangamon Co., IL; Died 20 July 1916, Girard, Crawford, KS. (See Strong) They had two children: Millicent Jane Strong (who died in infancy); and George Washington Strong Sr. Married Anna Kelly. Dr. Charles Henry Strong (one source called him Charles Hosea Strong) was born on a farm one mile east of Girard, Pennsylvania. He received his education in the public schools, and at the age of sixteen attended the academy at Springfield, Pennsylvania. Two years later he entered college at Girard, from which he was graduated in two years. He taught school in both Erie and Crawford County Pennsylvania for eight years, then taught three years in Madison and Painesville, Ohio. From there he moved westward and lived in Attica, Indiana, Belvedere, Illinois, and St. Joseph, Missouri before he again became a teacher, this time in New Berlin and Loami in Sangamon County Illinois. He taught the academy at Loami for two years, and in 1849 turned his attention to medicine. He studied under Professor J.W. 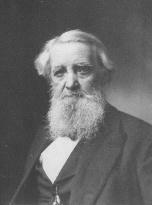 Bishop, dean of the faculty in the Cleveland Eclectic Medical College, and later took the course of lectures and graduated in 1858. He was engaged in practice in Sangamon County, Illinois for about eight years. He married Frances Fowler Strong on April 31st 1861 in Loami. This may have been a second marriage. 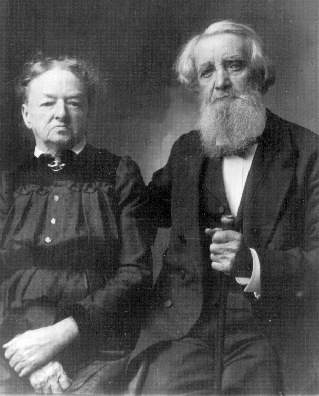 Mormon Temple records indicate that before 1854 he married Harriet Silverthorne-- a distant cousin. They may have had two children. (I, however, doubt the accuracy of this information.) They had two children, George Washington Sr. born in 1863, and an older daughter who died in infancy. 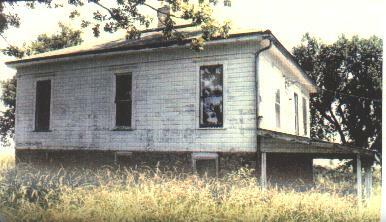 He practiced medicine in Sangamon County, Illinois, until coming to Kansas. The only time he did not practice in Illinois was while he was in the army. During the Civil War Charles Strong was second assistant surgeon for the 130th Illinois Infantry. Unfortunately no record of Him in his unit can be found. A walk of the cemetery at Loami, where his Fowler kin are buried, revealed that most of the Civil War veterans buried in this cemetery were enlisted in the 30th Illinois. Thus records of his life may have mistakenly recorded his unit. After the war Charles Strong returned to Illinois. 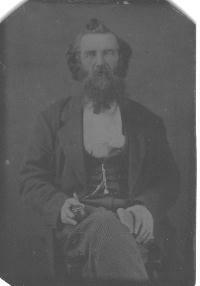 "Dr. Strong's health failed while he was in Illinois, and he came out to Kansas in December, 1865, believing that he could hardly live three months. In his own words, `the gentle zephyrs and dry and healthy atmosphere of Kansas, the change of weather and diet, venison and prairie chicken, were a great help, in a month's time I began to gain strength and an appetite, and have not had a week's sickness since.'" In 1868 he also laid out the new city's cemetery. As previously stated at this time there were no organized public schools in the new county. There was not one single public school house or school district. Dr. Strong was re-elected to the office of county superintendent of schools in 1868, and with much aid from the citizens of the county organized in the next two years 103 separate school districts and thereby established public education on a firm and permanent basis. In this capacity he accomplished "a most praiseworthy achievement for the future welfare of the county and made a record that is perhaps unsurpassed in the history of the state's education." This was far more districts than any other County in the state of Kansas. Mr. McVicar, the state superintendent of schools, reported that no other county could show a larger number of school districts organized in a similar amount of time. "As Crawford County is known to be one of the best counties in the state for agricultural purposes as well as stock raising, I wish to say to immigrants, come to Crawford County and enquire for Hamilton's crossing on Lightning Creek, and I will assist you to locate on the best land in the west, 'without charge' between Lightning and Hickory Creek, near saw mills, one at Crawfordville, where any amount of sawed lumber can be had; and one near Jacksonville. Any amount of building stone of the best quality nearby, and the best neighbors in the world. Our excellent Superintendent of Public Instruction, Dr. C. H. Strong, has laid the county off in school districts, and schools are in running order in most of the districts; Sunday Schools in every neighborhood, and meeting every Sabbath by Universalists, Methodists, Baptists, Christians, &c., and strange to tell, not a drop of whiskey sold in Sheridan, Osage, or Grant townships, I say come on, I want to locate 100 families. "For schools and churches we have as good and better facilities and a more progressive people than I have seen east. I predict in the short future of the great wealth and prosperity of this country, when it shall be more fully developed. The health of this county is good. People who come here sickly, emaciated, with different diseases, soon become rugged. Very little chills; water of a clear, sulphury nature, and, therefore, healthy; climate good, and nights cool. More anon. The life and times of Dr. Strong in the town of Girard are well documented and his founding of the town has become the stuff of legends but few people know that he later tried to start another town in the same region of the state as Girard. It is not so well remembered that he lived elsewhere for a number of years during Girard's early development. Nearly forgotten is Strongtown, located to the northwest of the intersection five miles north of Fourth and Broadway, Pittsburgh. Dr. Strong was the first postmaster of the Strongtown post office, established March 26, 1873. The post office was discontinued Jan. 21, 1876, in favor of Lacoy, which continued until Jan. 5, 1883. Lacoy had been started six miles northeast of Pittsburgh but moved to a new site at the time its post office opened, on the same quarter section as Strongtown. It is known that Dr. Strong still resided at Strongtown in 1887, but the exact date of his return to Girard in not known. One of Dr. Strong's granddaughters, living in Girard in 1984, recalled that Dr. Strong's drugstore was on the present location of the Matthews Drug Store at the northwest corner of the square. 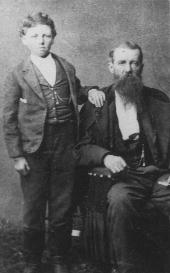 His home, Girard's first cabin, was on the West side of Summit Avenue about one and a half blocks north of the store, where the W. D. Smith Funeral Home now stands, which property was owned by the Strongs until 1893. One day an Indian came to the door of their "little house on the prairie," and Mrs. Strong became frightened. She grabbed up their only son, George, and covering him with her apron, ran as fast as she could to the drugstore. It was not known if the Indian meant any harm. And this year they established a memorial statue of a deer with inscription in the south-west corner of the court house yard at Girard to commemorate to founding of Girard, Kansas in honor of grandfather Strong. Terrific blowout. There were a great many there including myself. 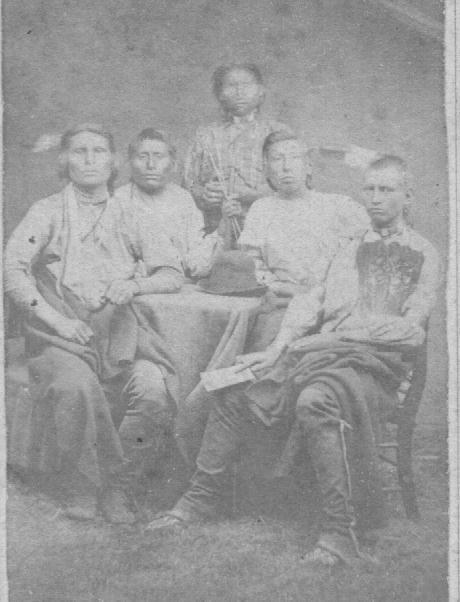 My participation included telling an audience a few things about father Strong (we always called him father, not grandfather) so, among other things, I told the gathering about the time when father was captured by the Indians, how he escaped, and how years later five members of the band of Indians who captured him came through Girard with some horse traders and recognized father. Through an interpreter they told father who they were. Well, to make a long story short, father got hold of a photographer and with difficulty persuaded the five to pose for a picture. They thought they were going to be shot - they didn't know what a camera was. Well, anyway, Nell [George's sister] gave me the one remaining, faded, blurred copy of the photograph and I have an artist now at work on It to redo and enlarge the image. Of course, as you will surmise, this Indian affair happened before I was born. But it did happen and if my artist can dig out enough detail I should end up with a picture of the five with buckskin trousers, blankets, bows and arrows posed around a round table. Cemetery laid out by Dr. C. H. Strong 1868." The facts of Dr. Strong's life are well recorded in a variety of places. At least three books were written about the people, history and families of Crawford County and Girard, Kansas. The Girard newspapers have been filled with articles and stories mentioning him from the time he arrived in the area until the present day. There is a photographic portrait of Dr. Strong and one of his wife, Frances Fowler Strong, hanging in the Carnegie Library in Girard. He was selected as an outstanding pioneer and there is a photograph and a biography of him hanging in the Hall of Fame at Friends University in Wichita, Kansas. Not to mention the Statue of a deer and commemorative plaque on the southwest corner of the square in Girard! If you are related to Charles Strong or would like more info send mail to me by clicking here.